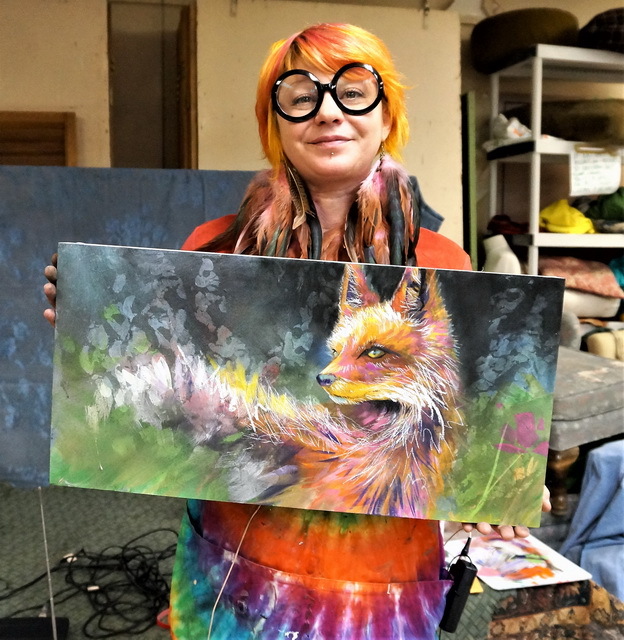 Sharlena, the consummate artist whose favorite colour is orange as apparent in her funky coiffure, shared her signature abilities with mixed media (combining acrylic painting and drawing) in tonight’s demonstration, starting with a prepared acrylic painting of a fox. Her preference of substrate for this particular method is a wooden panel, as adherence of the mediums will not be compromised. 1. 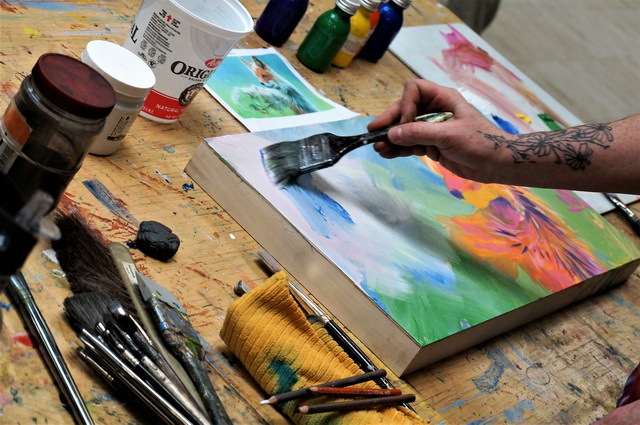 Acrylic painting – keep it simple, block in or layer and develop as much as you want. Approach the painting in your favorite style. It can be more refined and specific if desired or very loose and abstracted. All spectrums work well as a base painting. 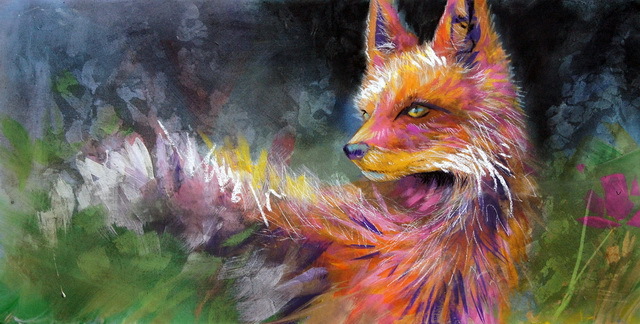 A unique approach to the wildlife subject is the freedom at the beginning of an art work, painting loose and liberated, because the details and refinement can come later with drawing. 2. Dry Media Ground application all over the acrylic paint or in specific areas. Allow to dry. You can get by without Dry Media Ground if you use an absorbent surface i.e. birch panel or watercolour paper & thin, watercolour-like acrylic layers. Potential issues: too much texture, thick acrylic, gloss factor, not enough tooth for layers of pastel. Acrylic mediums with matte finishes can also stand in as they can offer a little tooth but none of them compare to actual ‘Dry Media Ground’ medium. 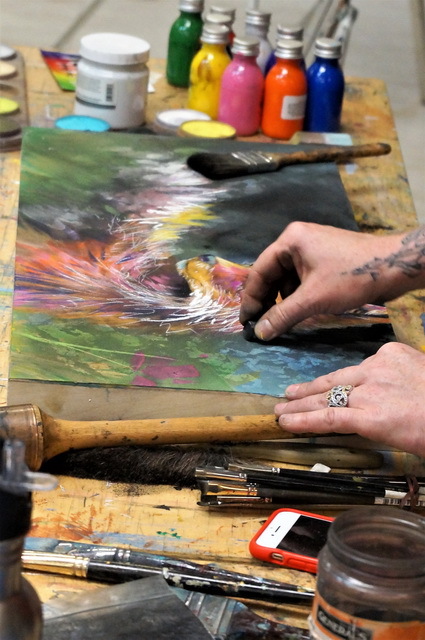 Tri-Art brand recommended over all other brands – offers same surface as Jack Richeson’s Colourfix Sanded Pastel Paper. 3. Charcoal Powder application all over or in specific areas, then use Erasers to pull out the light, negative shapes and any areas that we really liked. Why Charcoal Powder? It will take care of the mid-darks very quickly. It is easily erased. It will also come in handy later for softening and toning down pastel colours for shadows. You do not need to use Charcoal Powder if it seems too dramatic for you. 5. Krylon Crystal Clear spray – hold can 2-3 feet from your work, and apply many light layers, build up very slowly and don’t aim to ‘varnish’ or create a clear coat, or you will saturate the pastel. 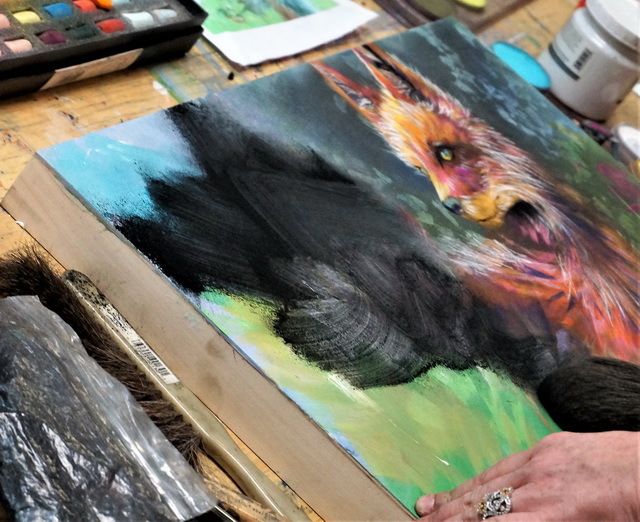 This step simply sets the pastel/charcoal, so even after many layers, the pastel should still remain soft and somewhat workable. May need to be framed under glass, ask you framer about UltraVue glass and clear or black ‘spacers’. The end result was a painting that was both colourful and intriguing. 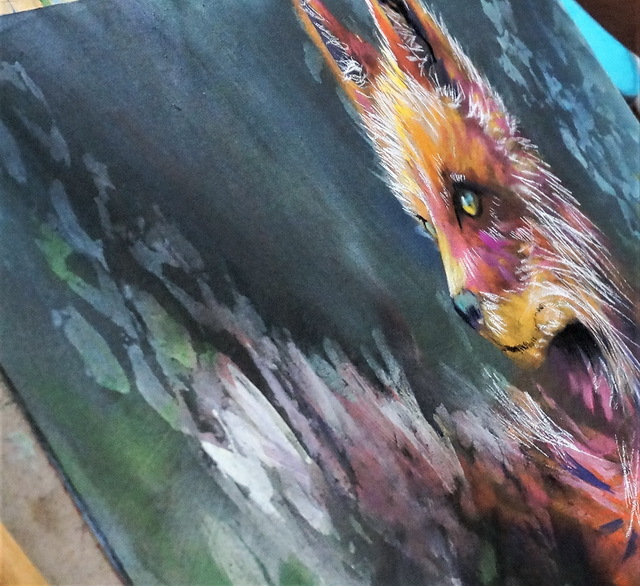 Unlike some other artists, the fact that Sharlena is so willing to share her process with us is very much appreciated. She is a superb, imaginative artist and welcome at DVAC anytime and we thank her for sharing.